As he turned at the top of his mark to deliver the fourth ball of his 13th over, Trent Boult had claimed just six wickets in his last 826 deliveries in test cricket. 15 balls later, he had six more. 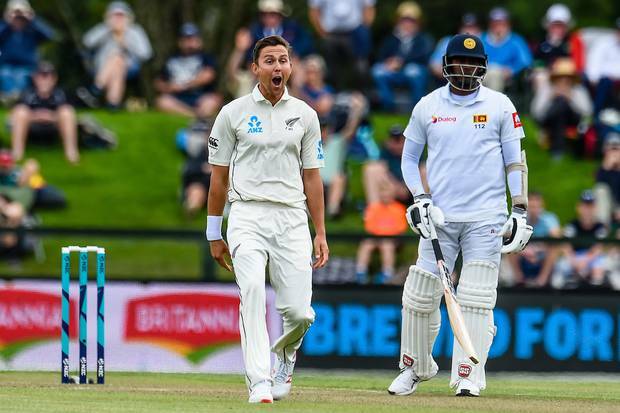 In what was statistically the greatest test spell produced by a New Zealand bowler, Boult's brilliance early on day two caused a complete capitulation for Sri Lanka, and put the Black Caps stunningly in command of the second test. By the time the day had ended, the Black Caps could claim it as one of their most dominant days of test cricket. Jeet Raval had struck 74, Tom Latham was unbeaten on the same score, Kane Williamson hit 48 and the Black Caps were sitting at 231-2, a lead of 305 runs. It was a position possible because of Boult's brilliance. The lethal left-armer changed the entire outlook of the test in the space of a phenomenal 15 balls. His six wickets in that spell was the fastest accumulation of six wickets in test history, tied with West Indian Jermaine Lawson, while no player had claimed five wickets in 11 balls in test cricket before Boult accomplished the feat today. At 94-4 in response to the Black Caps' first innings of 178, Sri Lanka looked likely to at least come close to a first innings lead, before Boult broke their innings, and their spirit. He started by ending the promising 43-run stand between Angelo Mathews and Roshen Silva. Silva edged a full delivery to Tim Southee at third slip, before Southee then took a brilliant low one-handed grab to dismiss Niroshan Dickwella. It ensured Southee was still the man of the hour, but his strike bowling partner needed no help with the rest of his dimissals as he stole the spotlight. The last four batsmen were all trapped lbw for ducks, with Dilruwan Perera and Lahiru Kumara not offering a shot, while Suranga Lakmal and Dushmantha Chameera had no answers for Boult's pace and swing. Chameera at least managed to see off a hat-trick delivery, but fell the ball after, as Boult took a triple-wicket maiden as part of his stunning spell of 6-4, and earned career-best figures of 6-30. Spare a thought for Mathews, who amongst all the carnage, stood watching in disbelief at the other end as all six of his partners departed, and ended unbeaten on 33, Sri Lanka's top score as they were rolled for just 104. To make matters worse, Raval and Latham then proved it wasn't the wicket which had caused Sri Lanka's demise. After 20 wickets had fallen in three and a half sessions, the Black Caps openers went a session and a half unbroken, adding 121 runs. Raval brought up his first 50 in over a year in a quality innings, but fell short of a maiden test century, inside edging Perera off his pads, with the catch snaffled up at short leg by Kusal Mendis. Williamson got a top edge on an unnecessary uppish cut to fall short of his own 50, but Latham held strong, only offering one chance in his unbeaten 74 as he aimed for a second straight century. Ross Taylor added an quick unbeaten 25 before stumps as Sri Lanka's chances of victory were left in dire straits - vanquished by a Boult from the blue.